Delhi, 04 October, 2018: The Akshaya Patra Foundation in partnership with Concentrix India and DLF CyberHub organized Daan Utsav 2018 to #BuildAFuture, a musical evening at CyberHub Amphitheatre, Gurgaon. The event was initiated to garner support to build the future of children and celebrate their promising and bright aspirations. A campaign to feed 1 lakh beneficiaries of Akshaya Patra was activated through five Mega Jigsaw puzzles set up at Cyber Hub. A memorable experience was woven by a flash mob, classical dance performance, and musical performances by Mr. Spandan Banerjee & Mazhab – The Band. Also, ‘Nukkad Nataks’ were enacted throughout the day to spread awareness about the challenge of classroom hunger and malnutrition that millions of children face every day. The event was graced by Mr. Ravinder Rana VP & GM India, ASEAN, and ANZ Concentrix India, and Mr. Mathan Varkey – National Director, Corporate Partnership, The Akshaya Patra Foundation. 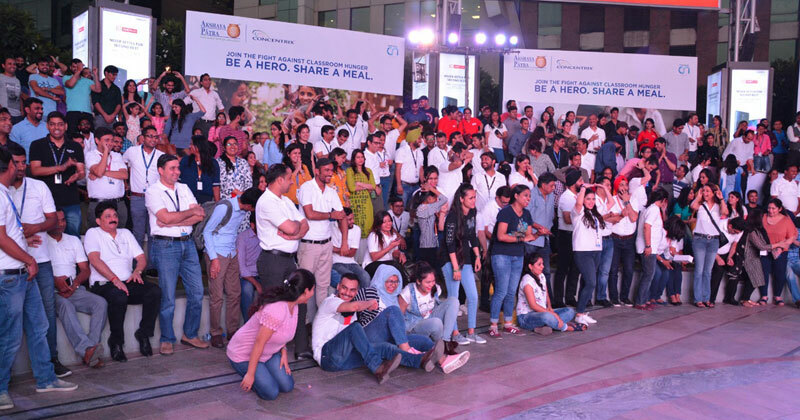 The event left an impression on more than 5,000 people, and more importantly, it served to boost awareness about the cause by a video message from Celebrity Chef Sanjeev Kapoor. The Akshaya Patra Foundation is a not-for-profit organisation headquartered in Bengaluru, India, which strives to address issues like hunger and malnutrition in the country. By implementing the Mid-Day Meal Scheme in Government and Government-aided schools, Akshaya Patra aims to fight hunger and at the same time, bring children to school. Since 2000, Akshaya Patra has worked towards reaching out to children with wholesome food every single school day. The Foundation is continuously leveraging technology to cater to millions of children. Its state-of-the-art kitchens have become a subject of study and attract curious visitors from around the world.